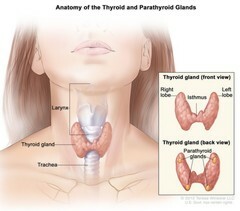 Anatomy of the thyroid and parathyroid glands; drawing shows the thyroid gland at the base of the throat near the trachea. An inset shows the front and back views. The front view shows that the thyroid is shaped like a butterfly, with the right lobe and left lobe connected by a thin piece of tissue called the isthmus. The back view shows the four pea-sized parathyroid glands. The larynx is also shown.